Extruded concrete is a versatile material. Here U-shaped ultra-thin folded fins made of extruded concrete were used for Boston University, Center for Integrated Life Sciences & Engineering. Rainscreen and cladding systems aren’t the only use for extruded concrete forms. The material can be folded when wet and made into “U” shapes, “L” shapes, or put into a mold for curved parts. These unique shapes and designs can be incorporated into both interior and exterior features. Folded concrete can replace traditional aluminum “fins” on building exteriors. Such fins provide solar shades on tall buildings and decorative adornments to the structure. With new 3-D concrete design as an option, fins can be designed and then installed directly onto the curtain wall. Decks and rooftops can also benefit from the strength, durability, and light weight of extruded concrete panels. As a deck surface, for example, the material is able withstand foot traffic and deflect rain and snow, making it an affordable alternative to traditional wood decks. Moreover, the difference in maintenance requirements between a traditional wood deck and a concrete panel design is impressive: where wood requires stains, sealants, and occasional power washing to keep the wood in good shape, concrete will maintain its appearance without any risk of deterioration. This fact alone makes it a good choice over wood, which regardless of how well it is cared for will at some point begin to degrade, either from exposure to the elements or from bug infestation. Moving away from exterior cladding, extruded concrete forms can also be created to enhance building interiors, whether through interior finishes or even custom-designed concrete furniture, such as tables, chairs, benches, or couches. Salt Lake City recently dedicated Fire Station 14, the first net-zero energy, LEED Gold-certified fire station in the country, as part of the city’s broad commitment to a 100 percent renewable energy goal. In addition to the stringent standards necessary for the achievement of LEED Gold certification, a net-zero energy structure must create at least as much energy as it consumes. So it’s not surprising that Station 14, shown here, is a showcase of state of the art sustainable design. More than 300 photovoltaic solar panels generate enough electricity to offset 100 percent of the building’s power consumption. High-performance, triple-glazed, argon gas-filled glazing with ceramic frit reduces solar heat gain and improves overall efficiency. Equipment bays are designed to conserve energy through passive cooling, shading strategies, and high-speed, super-efficient fans. Many other features are utilized, from radiant floor systems using geothermal heat to specialized lighting and appliances. A key component of the high-performance envelope is the cladding, incorporating unitized glass fiber-reinforced extruded concrete panels. The material was chosen not only for its physical properties and contribution to the energy efficiency of the high-tech building envelope but also for its character in the overall design. The architects wanted to reflect the important community mission of the fire station and the strength of those within. The natural look of the products chosen helped to create a dense and strong structural appearance. 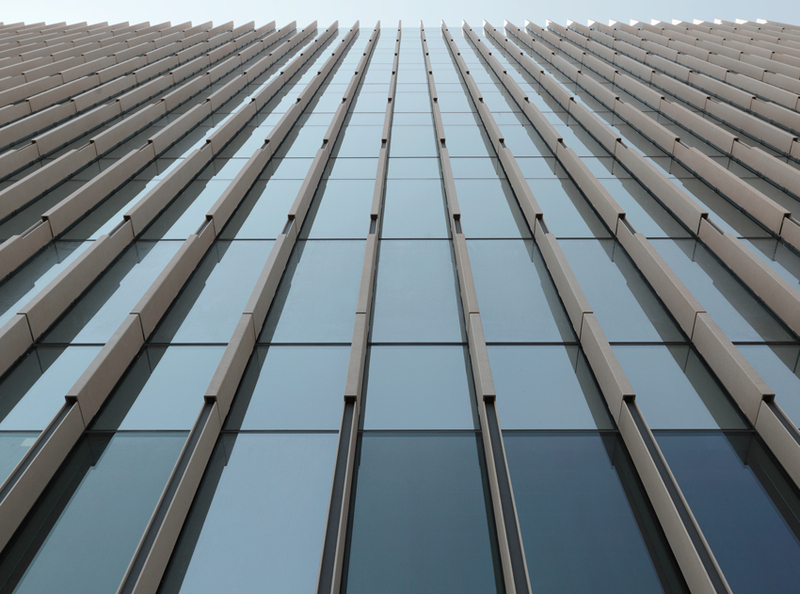 The diversity and high performance of fibreC glassfibre reinforced concrete allows cost-saving construction of high quality, cutting-edge facade systems with long-term durability. It is authentic—in line with the current trend towards natural and sustainable materials.